Make a new holiday tradition with this wonderful whole roasted turkey stuffed with an herbed bread dressing studded with walnuts and dried cherries. For Turkey: Remove giblets and neck from turkey. 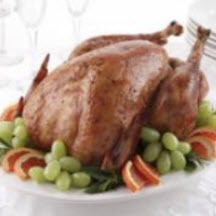 Rinse turkey with cold running water and drain well. Blot dry with paper towels. Remove backbone and legs from turkey. Sprinkle turkey with salt, pepper and garlic. Roast legs along with the breast in a shallow pan, on a rack in a preheated 350°F (175°C) oven for about 20 minutes per pound or until the internal temperature reaches 170°F (80°C) in the breast and 180°F (85°C) in the legs. For Dressing: In a sauté pan, melt butter; add onion, celery and walnuts. Sauté until crispy tender. Add water, sour cream, cherries and seasoning packet from dressing (if appropriate). Bring to a boil. Stir in bread crumbs and mix until liquid is absorbed. Place in a prepared baking dish and bake in a preheated 350°F (175°C) oven for 20 minutes or until internal temperature reaches 165°F (75°C).